After briefly trying the game at Essen I bought Dojo Kun immediately at the fair. I met the designer at there and he was a genuinely nice guy who signed my copy of the game and did a cool drawing in it. I named it my favourite game of the con after only playing half a game. And now I have finally played it for real. I REALLY wanted this game to be awesome. So how did it fare? What is Dojo Kun like? 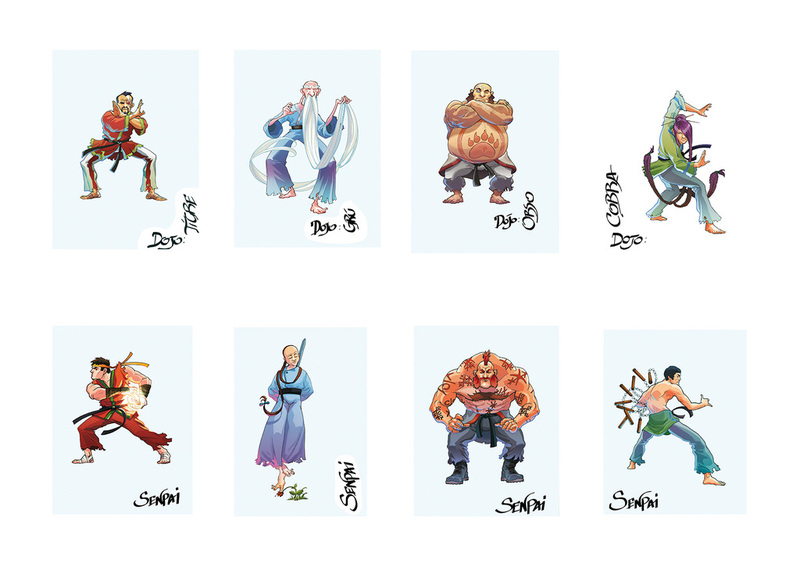 Dojo Kun is a martial arts themed game by Roberto Pestrin. In Dojo Kun each player run their own Dojo. The goal of the game is to train martial arts athletes who can compete in the black and white lotus tournaments. Winning these tournaments will grant you a lot of victory points for the end of game scoring. The game takes place over four seasons. Two of these are tournament seasons, and two of these are training seasons. The two types of seasons at the same time feel like separate games, but still one is deeply dependent on the other. In the training season you take actions in a worker placement-like system with your trainees and your sensei. Almost all the spots are for one ‘worker’ only. Some are only for senseis and some only for athletes. You will make them do different tasks that will level up the trainees and improve the capabilities of the dojo. The better you have managed this the better chance you have of winning the tournament. A lot of the tasks you do and the stuff you get will also either give or subtract victory points. Fighting in the tournament is a dice chucking affair. The better the fighters the more dice (and special moves). 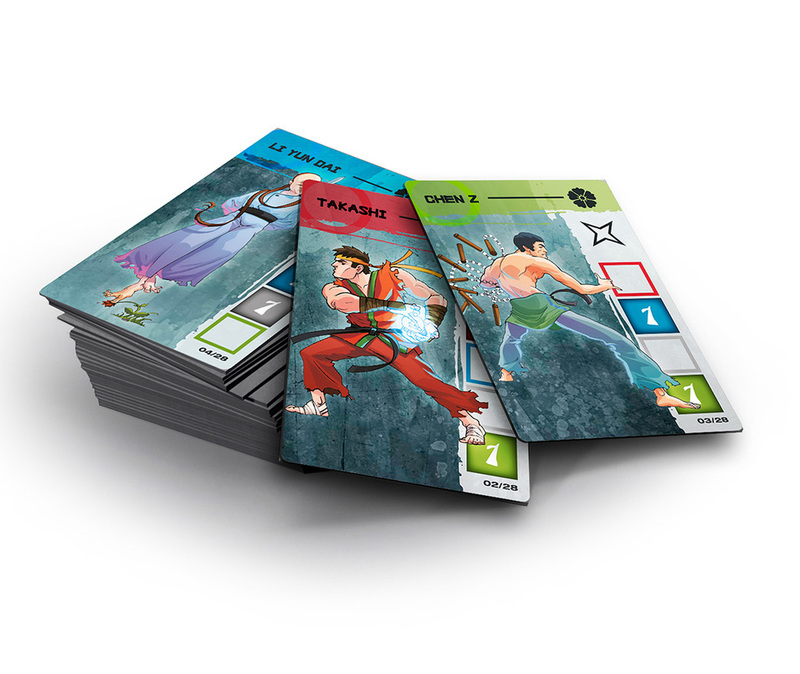 Each player will have up to two fighters fighting in the tournament, matched against random opponents (yes your athletes can fight each other). There are three rounds of fighting with the losers of all fights being eliminated. There is a lot of strategies to explore in this quite simple game, and the dice mechanics in the tournament is a random element that is rarely seen in this type of eurogames, but which also matches the theme incredibly well. My liking of this game have cooled off a bit since Essen – but I still like it a lot. The biggest fault of the game is that sometimes a single match in the tournaments will drag out. The game does have a betting mechanism in place to try and keep everyone engaged even those who are not fighting. But still it can be a bit boring at those times. But at other times when the matches zings along the game is a joy. You feel like you get a relationship with your fighters in the training/worker placement phases of the game and you want your fighters to succeed not only because of the victory points, but also because you want the bragging rights, the thrill of winning. When the game flies by it is quite a bit of fun. You have to be in on the premise and accept that the dice can screw you over in a big way in what is otherwise a quite simple worker placement game. But if you get four people who really get into it and role-play their fighters a bit it is marvelous. It is a tight little package. The mechanics and theme feels very intertwined. You really hope for your fighters to win those matches and go go far in the tournament. If you are looking for a simple euro with a dice and luck heavy element, that is also heavy on theme. You got it right here. It might be a limited crowd, but this game fires on all cylinders theme wise. The game is beautifully illustrated. Icons and iconography matches the theme and it feels like a complete package. The layout of the manual is great as well. The game has one other fault apart from what I mentioned under the general rating: it is a bit fiddly. A lot of components are very small, and the tournament phase requires the moving of small cardboard chits a lot. It is something you learn to work around, but it could have and should have been done in a better way. Other than that I can’t fault the game much in this category. The rulebook is well done with big lovely easy to read pages and the cardboard quality is good. This game is a mid level game complexity wise. If you have played any other euro game it will be smooth sailing, but if this is a first euro style game, it might take a game or two before you understand everything. But I still think this is a game that can be played by families just fine, and I actually think that families kids from 8-10 and up will enjoy this game.